In aquaman’s underwater headquarters Jackson sees images of aquaman his wife mera and their dead son. 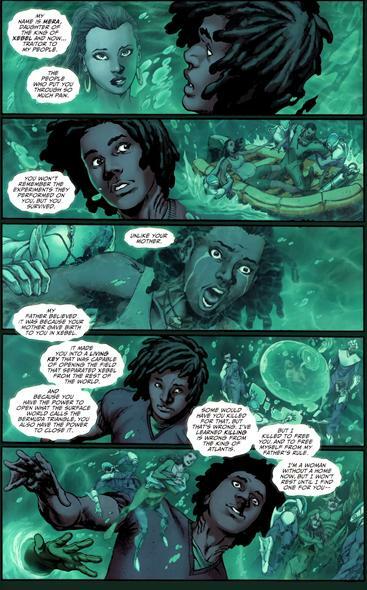 Aquaman tells Jackson his biological father was the child’s murderer. Following the map from issue #11, Jackson and Aquaman come to a cave. Inside the cave is another chest only Jackson can open. Inside he hears Mera’s voice and sees images of his real mother and how she was abducted by the Xebel; Atlantis residents with extreme xenophobia against the surface and limited hydrokinesis; tortured and experimented on. He also learns he is the key to freeing the people of Xebel from the Bermuda triangle which will cause a war with the surface world. Aquaman wants Jackson to quickly accept his birthright so they can go confront Siren and his father. Reluctant and emotional he lashes out at Aquaman and they have a brief scuffle. Aquaman reveals his own mixed heritage and how destiny pulled him in, this inspires Jackson who don’s the Aqualad costume left for him by Mera’s treasure. He is also given weapons called waterberers to help him focus his Hydrokinesis. Not ready for what comes next he puts on a brave face. Firestorm is in a containment matrix while the Justice society of America tries to contact metamorpho who will theoretically be able to help them stabilize. They continue to bicker and when Ronnie makes a quip about the lack of paternal connection between Jason and his dad, Jason gets angry. The duo then apparently go supernova and destroy all creation. Deathstorm chides his captives letting them know he’s more powerful than Firestorm. He gives them one chance to stop him before he kills both their sons in the slowest and gruesome manner he can imagine. He creates a gun and gives it to Jason’s dad who unpredictably tires to commit suicide to save his son. 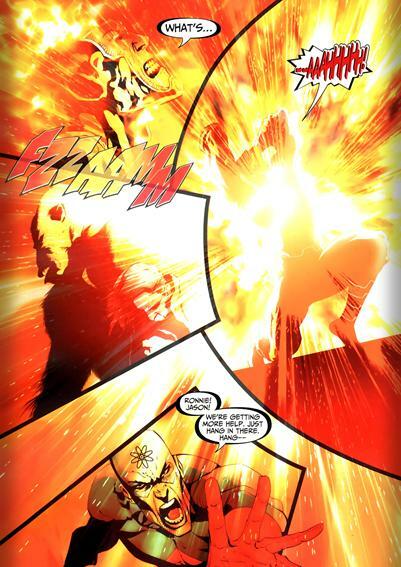 The gun however has no bullets and the villain picks up the white Lantern to drop it off with someone else. Art as always was top notch; both the cover and interiors are gorgeous. The Story: I’m really intrigued by what’s happening with Firestorm and Aqualad. 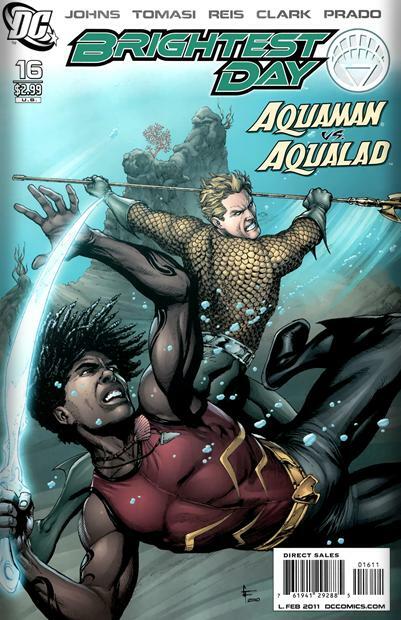 In this issue we get the origin of Aqualad and his powers and we learn the fate of his mother. 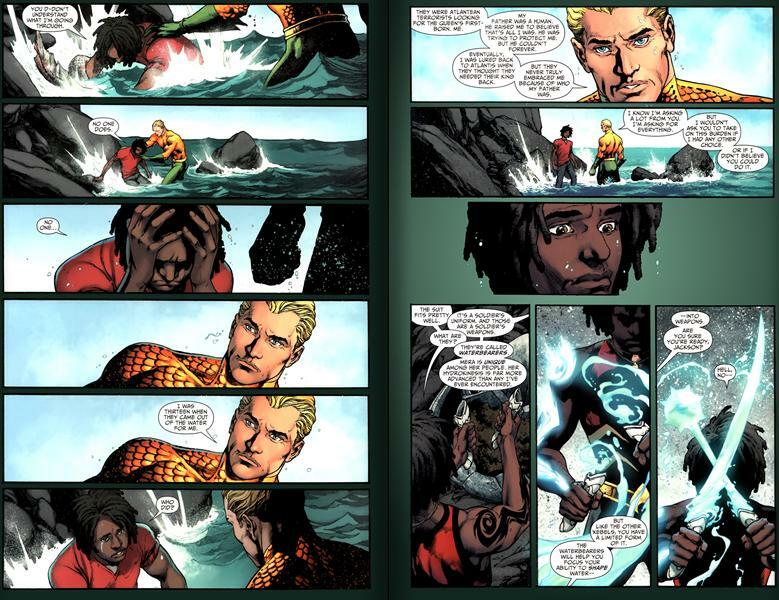 We also get a nice parallel between Aquaman and him. Their histories and how they came into their power is also similar enough for them to have an understandable connection. The firestorm situation continues to worsen as Jason and Ronnie…I don’t see them ever getting along! This issue felt “fillerish” nothing substantial really happened….a whole comic for this?